Once upon a time.....there was a large tabby cat which , from the minute she arrived at the farm, spread terror among the mice that lived in the cellar. Nobody dared go outside for fear of falling into the clutches of the awful cat. The fast-shrinking mouse colony decided to hold a conference to seek a way of stopping themselves from becoming extinct. Taking advantage of the cat's absence one day. mice of all ages streamed into the conference room. And certain that they could solve the matter, each one put forward a suggestion, but none of the ideas were really practical. ''Let's build an outsize trap, '' one mouse suggested. When this idea was turned down, another said: ''What about poisoning her? ''But nobody knew of a poison that would kill cats. One young widow whose husband had fallen prey to the teeth, so she can do no more harm. ''But the conference did not approve of the widow's idea. At last, one of the mice wiser than the rest, scrambled to the top of the lantern that shone over the meeting. Waving a bell, he called for silence:' We'll tie this bell to the cat's tail, so we'll always know where she is! 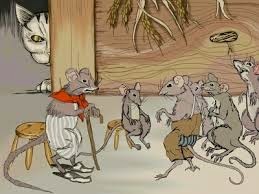 We'll have time to escape, and the slow and weaker mice will hear her coming and be able to hide!'' A round of hearty applause met the wise mouse's words, and everyone congratulated him on his original idea. ''......We'll tie it so tightly that it will never come off!'' ........She'll never be able to sneak quietly up on us again! Why the other day. she suddenly loomed up right in front of me! just imagine......''' However, the wise mouse rang the bell again for silence. ''We must decide who is going to tie the bell on the cat's tail, ''he said. There was not a sound in the room except for a faint mummer: ''I can't because.....'' ''Not me! ''''I'd do it willingly, but...''Neither can I....'' Not me ! ''Not me!'' Nobody was brave enough to come forward to put the plan into action, and the conference of the mice ended without any decision being made. It's often very easy to have bright ideas, but putting them into practice is a more difficult matter.